What prizes are awarded for each super secret training levels? I do not have internet. I kow that cerebii has a good site for this question, but I cannot access it. Can someone get me screenshots of the site, or copy and past it, or something for me? Thanks! How did you acess this site then? Its impossible to do so without internet. Blazo's got a point .. 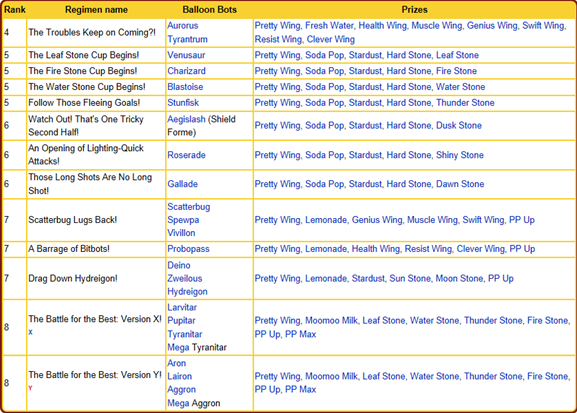 These are the main prizes, you get smaller prizes too but are not really important, just wing items, hard stones, startdusts etc. How do you know what stats to super train in for each Pokemon? Can you only get each evolution stone once through Super-Training in ORAS?